If we can celebrate anniversaries of man's first landing on the moon, why not also commemorate the first time Michael Jackson landed on his signature move, the moonwalk? It was 30 years ago, on March 25, 1983, that Jackson shimmied backward across the stage at the Motown 25 taping, a few scant seconds of showmanship that may have marked the critical turning point from his being a superstar to being the superstar of his era. But if you believe that Jackson invented the moonwalk, you probably also believe that P. Diddy invented the remix. Trying to determine the exact creator of the moonwalk dance is like trying to pin the invention of rock 'n' roll on one artist. It is, as writer Shanna Freeman has said, "the product of more than 70 years of dance evolution." Cab Calloway liked to say that he'd been doing pretty much the same moves since the 1930s. The earliest footage that portrays someone doing something nearly identical to Jackson's fancy footwork in 1983 belongs to dancer Bill Bailey. No, it wasn't Jody Watley who was taking that early '80s soul trio's trips to the moon. It was the group's designated dancer, Jeffrey Daniel--a former "Solid Gold" hoofer who was renowned in the R&B/dance community--who attracted attention what was then referred to as "the backslide" before he taught it to Michael. And apparently Jackson held the move in the back pocket of his skinny pants for months or years before he decided the Motown special was the place to bust it out. Naturally, there are some variations that go into the myth-making around what happened at that March 25, 1983 taping. "Everything that you saw him do, he made it up on the spot," Jermaine Jackson has said, a contention that gives Michael far more credit for spontaneous genius than he gave himself. LaToya's version gives credit where credit is due: "The moonwalk was a dance that the kids were doing on the streets," she's said, "and Michael came along later. And he had a guy by the name of Jeffrey Daniel to teach him to do the moonwalk...and when he did it, everybody saw it and just thought this was the most wonderful thing they had ever seen, not really knowing it was a dance that was already out there." 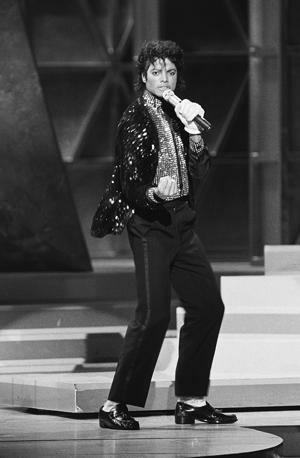 Michael was a little stingy with the credit in his autobiography, although he was quite open about the fact that his key move at the fateful taping for Motown 25: Yesterday, Today, Forever (which aired two months later) was not his own innovation. "I had been practicing the Moonwalk for some time," he wrote in his 1988 memoir, which tellingly was titled Moonwalker, "and it dawned on me in our kitchen [on the night before the taping] that I would finally do the Moonwalk in public on Motown 25. Now the Moonwalk was already out on the street by this time, but I enhanced it a little when I did it. It was born as a breakdance step, a 'popping' type of thing that black kids had created dancing on the street corners in the ghetto...So I said, 'This is my chance to do it,' and I did it. These three kids taught it to me. They gave me the basics--and I had been doing it a lot in private. I had practiced it together with certain other steps. All I was really sure of was that on the bridge to 'Billie Jean' I was going to walk backward and forward at the same time, like walking on the moon." The "three kids" to whom Jackson alluded were apparently Daniel and his compatriots, Geron "Casper" Candidate and Derek "Cooly" Jackson. Daniel was a seasoned professional who was actually three years older than Jackson, who was then 24, so you can judge for yourself whether Jackson crediting "kids" was a term of endearment or a deflection meant to bolster his sense of street cred. Jackson had been a fan of Daniel's. "He used to watch me dance on 'Soul Train," Daniel recalled in a TV interview. "I had no idea back then when I was watching the Jackson Five that they were watching me." In 1980, "Shalamar were doing a run at Disneyland and people were making a fuss about my dancing, so Michael brought little Janet," Daniel recalled in a TV interview. Backstage, they met for the first time, and that began a friendship that led to not only the moonwalk lessons but co-choreography credit for Daniel on the "Bad" and "Smooth Criminal" music videos. The best existing footage of Daniel doing the moonwalk comes from a 1982 "Top Of The Pops" appearance that wowed England. Daniel does not take credit for inventing the dance, saying it naturally emerged out of the developing popping and locking style, which emphasized sudden halts or pauses in a performance over sheer fluidity of motion. If you have secretly wondered all these years why the dance was called the moonwalk, but never been able to publicly admit it, rest easy--you're not alone. Jackson may have believed that the illusion of being able to "walk backward and forward at the same time" looked like "walking on the moon," but probably not many other people thought: Aha! Exactly like Neil Armstrong! But the name he coined for it caught on, of course. "Michael called it the moonwalk," Daniel said, but "actually the moonwalk is another dance." Or was, anyway. "The moonwalk is actually a dance that we do that makes it look like you’re on the moon and it’s less gravity than you would have on earth. Michel somehow called the backslide the moonwalk. And commercially, I think, maybe, it worked," he added, chuckling at the understatement of that remark. It's not a gravity-defiance thing, per se. "The backslide is actually supposed to be like if you were to be walking forward and suddenly you were on an escalator, and as you’re walking forward, this escalator is now pulling you backwards as you’re continuing to walk forward," Daniel said. "That’s the illusion of the backslide and the moonwalk, that you’re actually walking but the ground is pulling it back, if you can do it with that illusion. If you’re doing it looking like you’re pulling yourself back, like your legs are tugging you back--it’s not supposed to look that way." But before it was the "backslide," it might have gone by some other names. In the mid-'80s, shortly after Jackson made it the rage, one of the most legendary black entertainers from the first half of the 20th century, Cab Calloway, was reported to have gone into the move while performing in a Manhattan run of shows. According to a 1985 article in The Crisis: "Asked if his teenaged grandson taught him the move, Calloway said, 'Shoot…we did that back in the ‘30s! Only it was called The Buzz back then.'" Footage of some of Calloway's astounding footwork from the '30s shows a lot of moves that would definitely count as part of the evolution that led to popping and locking, though not quite anything that would strike a fan of contemporary hip-hop dance as an exact precedent. Other performers of that era also had slippery moves that involved illusions of moving while staying in place, if not the backwards-as-forwards magic of the backslide. But when you look at Bill Bailey from the '50s, it's pretty much all there. At least that "escalator" illusion that Daniel spoke of is. And he does it for almost 15 seconds in the relevant clip, as opposed to the five or so that Jackson spent moonwalking at Motown 25. But Jackson did add some signature arm and shoulder moves to his version of the dance. David Bowie also did something akin to the moonwalk in the opening moments of a performance of "Aladdin Sane," and although the term hadn't been coined at the time, he had the added benefit of really seeming like he was from the moon. Perhaps the oddest thing about Jackson's Motown 25 performance, 30 years later, is that his first reaction at the conclusion of his appearance was to feel insecure about it. "We first worked with him in 1980, but he did not do the moonwalk publicly until 1983," Daniel remembered in Time magazine after Jackson's death. "And after he did it, he asked, 'How was it?' And I said, 'Why did you wait so long?' He said, 'Well, it still didn't come out right.' I'm like, huh? This is the performance that totally blew everyone away--and he said something didn't come out right. Whatever was going on in his mind, we would never know it. We all know that it was a mind-blowing performance, and it just took him to another level." In his autobiography, Jackson went into detail about the reasons for his odd dissatisfaction with his Motown 25 performance--which apparently didn't have anything to do with his moonwalk execution. "I just remember opening my eyes at the end of the thing and seeing this sea of people standing up, applauding," he wrote. "And I felt so many conflicting emotions. I knew I had done my best and felt good, so good. But at the same time I felt disappointed in myself. I had planned to do one really long spin and to stop on my toes, suspended for a moment, but I didn’t stay on my toes as long as I wanted. I did the spin and I landed on one toe. I wanted to just stay there, just freeze there, but it didn’t work quite as I’d planned. When I got backstage, the people back there were congratulating me. I was still disappointed about the spin. I had been concentrating so hard and I’m such a perfectionist. At the same time I knew this was one of the happiest moments of my life." Although he never forgot that insecurity about his performance of "Billie Jean," he had some good help in getting over it. The day after it aired in May 1983, "Fred Astaire called me on the telephone," Jackson wrote in Moonwalker. "He said--these are his exact words--'You’re a hell of a mover. Man, you really put them on their asses last night...You’re an angry dancer. I’m the same way. I used to do the same thing with my cane.' I had met him once or twice in the past, but this was the first time he had ever called me. "It was the greatest compliment I had ever received in my life, and the only one I had ever wanted to believe...Later he invited me to his house, and there were more compliments from him until I really blushed. He went over my 'Billie Jean' performance, step by step. The great choreographer Hermes Pan, who had choreographed Fred’s dances in the movies, came over, and I showed them how to Moonwalk."